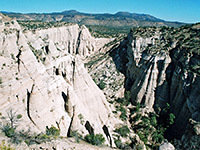 Facilities at Kasha-Katuwe Tent Rocks National Monument include parking, a self-pay fee station (entry $5 per vehicle in 2016, part of which goes to the Cochiti tribe), rest rooms, picnic places but no campground; all are set amid juniper-pinyon pine woodland next to the access road, from which two linked paths lead northeastwards into the formations, both designated National Recreational Trails. The 1.2 mile Cave Loop Trail winds across an open area at the foot of the cliffs, giving close-up views of cones, hoodoos, gullies and one cave-like alcove, while the more strenuous, and more varied Slot Canyon Trail forks off near the far side of the loop, following an initially very narrow ravine then climbing more steeply to a viewpoint above the formations. 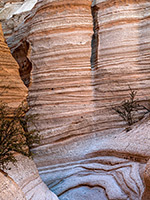 The Cave Loop Trail is the easiest path; this begins due north, soon passes one group of cones then curves around the upper edge of a side valley, crossing a few sandy washes and passing a small cave in the banded tuff cliffs, while staying fairly level. The views are good although the best formations are mostly out of sight, higher up the valley sides. The way ahead is frequently signposted, and the path has an above average number of regulatory notices, advising of the dangers of snakes, the need to stay on the trail, the ban on collecting rocks, etc. After the junction with the Slot Canyon Trail, the path moves southwards, back to the starting point. 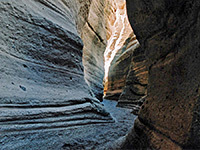 The 1.5 mile (one-way) Slot Canyon Trail is rather more interesting, one of the best short trails in the state. This branches off the Cave route and joins a stony wash that soon narrows to a proper slot canyon through the tuff. The ravine has curvy walls just a few feet apart but many feet deep, long, shady passageways through generally smooth rocks containing embedded pebbles, and just a few obstructions caused by dryfalls and chokestones; the maximum height is about three feet. 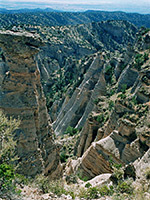 The pretty slot opens out quite suddenly after a quarter of a mile, to a still narrow gorge that contains a few tall trees growing in the streambed, after which the canyon ascends more steeply, through another brief narrow part then climbs even more sharply to the top of the plateau, where it splits into several paths that lead to viewpoints looking out over the Tent Rock formations, down Peralta Canyon and across to the far away Sangre de Cristo and Jemez Mountains. The total elevation gain is 640 feet. The plateau is more sparsely vegetated than the valley floor, bearing grasses, wildflowers and manzanita bushes. The most spectacular rocks are all around the last part of the trail, where they rise up to 90 feet, pure white, smoothly tapering and altogether very impressive. The path is popular, and despite the above average difficulty, most people manage to get to the end.